A map shows seismic activity around the site of a 5.8 magnitude earthquake that struck western Montana early Thursday. Volunteers helped clean up the mess at D&D Foodtown grocery, after an earthquake hit overnight. Assistant manager Ruth Baker says the damage included pickle jars and wine bottles. An image from the Montana Bureau of Mines and Geology's network of seismographs shows the 5.8 magnitude earthquake and aftershocks that began at 12:30 a.m. Thursday. The image "clearly shows the [initial] P-wave arrival followed closely by a series of strong S-waves and then numerous aftershocks," the National Weather Service says. An earthquake with a magnitude of 5.8 startled many people out of their sleep in western Montana early Thursday. The shallow quake was felt for hundreds of miles from its epicenter southeast of Lincoln, including in parts of neighboring states and in Canada. "We have no reports of injuries due to the earthquake at this time," member station Montana Public Radio reports. 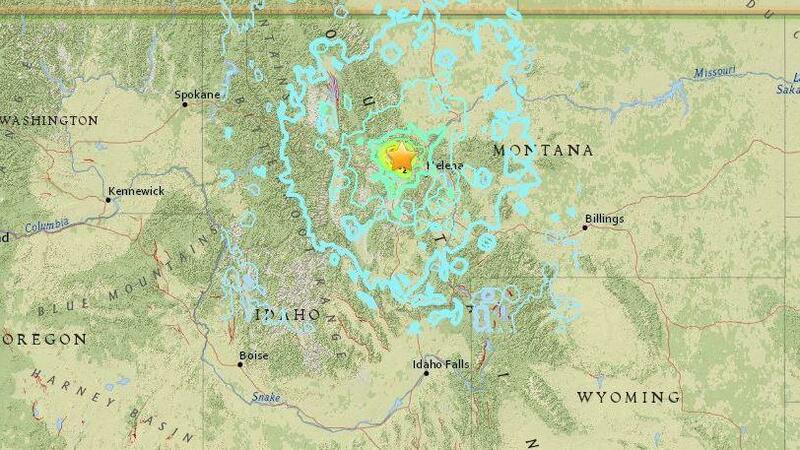 "Shockwaves are still being felt with decreasing intensity in parts of western Montana." Thursday's earthquake was the strongest to hit western Montana in years; it was slightly stronger than a 5.6 magnitude quake that hit a nearby area in July 2005, the U.S. Geological Survey says. Some alarmed residents said via Twitter that they woke to fears that an intruder was in their house; others said their dogs had seemed to sense the oncoming quake — and jumped on their owners to seek safety. "It was strong enough to wake people up across a wide area, and was felt along a line more than 500 miles long, from Billings to Spokane, Wash.," Montana Public Radio's Eric Whitney reports for our Newscast unit. Residents reported waking to the sound of pans clattering around and the feeling of their houses being shaken. "Woke me and my parakeet up," Terry MacPheat wrote on the MTPR Facebook posting about the quake, adding, "bed was shaking like something from an Exorcist movie!" Another MTPR listener, David Buckingham, reported, "I was awake here in Bozeman, sitting at my desk, when it happened; it felt like I was on a boat in choppy seas, and all the birds in my neighborhood simultaneously made a ruckus and flew away." Aaron Birkholz, who runs a roadside coffee stand — where a sign was touting "huckleberry shakes" Thursday — also compared the experience to being on a boat, telling MTPR's Whitney that it had given him motion sickness. "This one was different, it wasn't a real quick shake," Birkholz said of the earthquake. 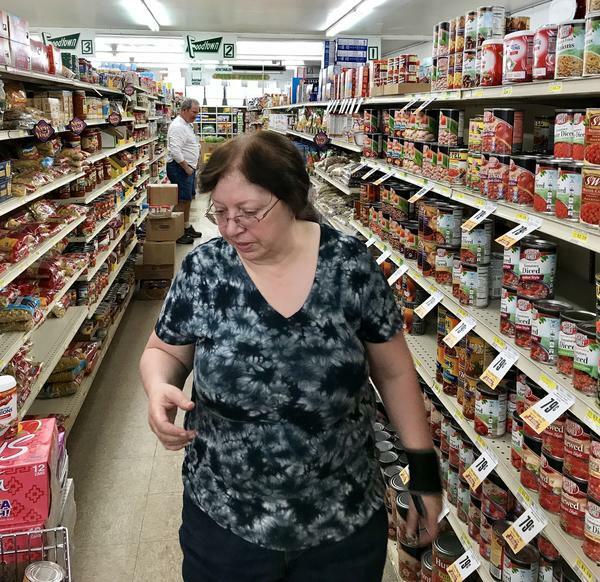 At the D&D Foodtown grocery in Lincoln, volunteers helped the store's staff clean up the mess Thursday, after the quake shook wine bottles, pickle jars and other items off the shelves. Assistant manager Ruth Baker tells Whitney that all the store's eggs made it through safely. At least 10 measurable temblors hit Montana from 12:30 to 1:31 a.m. Thursday, with the last two having magnitudes of 3.9 and 4.4, according to the United States Geological Survey. The quake's epicenter was some 230 miles from Yellowstone National Park — and because it was felt from far away, the shaking led some in the area to wonder whether the Yellowstone supervolcano was finally emerging from its slumber. But the Yellowstone Volcano Observatory's most recent volcano alert level is listed as normal, and the park service has said that while the area normally has more than 1,000 earthquakes each year, its experts predict a large eruption "very unlikely" to strike in the next 1,000 to 10,000 years. "The location and focal mechanism solution of this earthquake are consistent with right-lateral faulting in association with faults of the Lewis and Clark line, a prominent zone of strike-slip, dip slip and oblique slip faulting trending east-southeast from northern Idaho to east of Helena, Montana, southeast of this earthquake."